Fast convert MOV to PowerPoint more compatible format to successfully embed and play MOV in Windows PowerPoint Presentation and Mac PowerPoint Presentation. Windows PowerPoint 97/95/2000/2002/2003/2007 cannot insert and play MOV files. Windows PowerPoint 2010 can only play MOV video if the Apple QuickTime player is installed. Though Mac PowerPoint announced to play MOV video, it only plays QuickTime MOV video, it often fail to embed and play MOV movie created by Camcorder/Camera or edited by iMovie or downloaded from websites. To successfully embed MOV in PowerPoint for Windows or Mac, a recommended solution is to convert MOV to PowerPoint more compatible video formats. 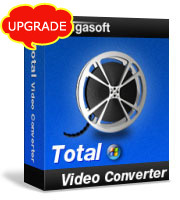 Bigasoft Total Video Converter is just the right MOV to PowerPoint conversion software. It can fast convert all kinds of MOV files including QuickTime MOV/iMovie MOV/iTunes MOV/Camcorder MOV/downloaded MOV to PowerPoint more compatible video formats like WMV, AVI, MPG, ASF, and SWF. Besides, it also can convert FLV, MP4, MKV, WTV, MXF, 3GP, MTS, AVCHD, VOB, WebM, and H.264 and more to PowerPoint. The following is a step by step guide on how to convert all kinds of MOV to Windows PowerPoint WMV, AVI, MPG or ASF format or convert non-QuickTime MOV to Mac PowerPoint MOV or MPG so as to successfully embed and play MOV in PowerPoint for Windows or Mac. 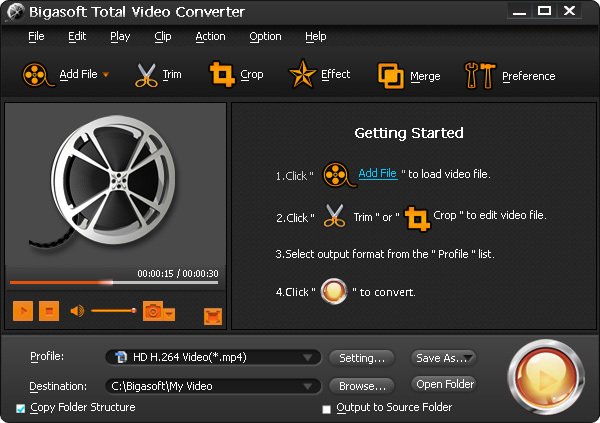 Download the free trial version of Bigasoft Total Video Converter (for Windows, for Mac), install and run it. Click "Add File" button to import MOV video to Bigasoft Total Video Converter, or simply drag and drop the MOV video to the main interface of this MOV to PowerPoint converter. Click the "Profile" drop-down button to choose PowerPoint supported video format from "General Video" category. To insert MOV into PowerPoint for Windows, it is recommend to select General Pocket PC Video (*.wmv), or MPEG-1 Video (*.mpg), or AVI - Audio-Video Interleaved (*.avi) as output video format. To embed MOV in PowerPoint for Mac, it is better to select MPEG-1 Video (*.mpg) or MOV - QuickTime (*.mov) as output profile. Click "Convert" button to begin converting MOV to PowerPoint compatible video format. It will be finished with high output quality and fast converting speed. After finish converting MOV to PowerPoint, click "Open Folder" button to copy the converted MOV movie into the same folder as the presentation, and then insert MOV into PowerPoint just as you embed other videos to PowerPoint.